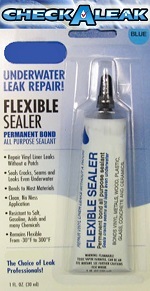 Standard Pools: Once the leak is found, it is easy to fix using a patch kit. This kit will work under water. After patching, check again with your Dye kit to make sure you sealed the leak. Please note that if you patch near a fitting, you will want to leave the pump off while it cures, so the flow of water doesn't wash the patch away. Vinyl Liner: If you find that the liner has pulled away or is leaking behind a fitting, we would STRONGLY recommend that you call in your local pool professional at this point. If you find the leak in the liner itself, it is usually an easy matter to patch, using a vinyl patch kit and following the directions.